Easy and Innovative Fast Checkout Process ONLY in CloudCart! by turning your visitors into customers! user-friendly design and autocomplete functions that will boost your conversion rates, reduce cart abandonment & improve your sales performance. Customers no longer have to fill in multiple Checkout steps to finalize their orders. CloudCart saves users time by using one-click adress localization and pre-defined delivery & payment methods. NO MORE high-abandonment cart rates (70% average for the industry). Our express checkout flow will reduce it by user-friendly design and autocomplete functions. NO MORE multiple Checkout fields that take long time to complete, annoy users and make them bounce from finalizing their orders causing lost revenue. NO MORE distractions with Headers & Footers that confuse users and prevent them from completing their order. NO MORE issues with orders from Mobile devices because of non-responsive design & long scrolling user-experience. 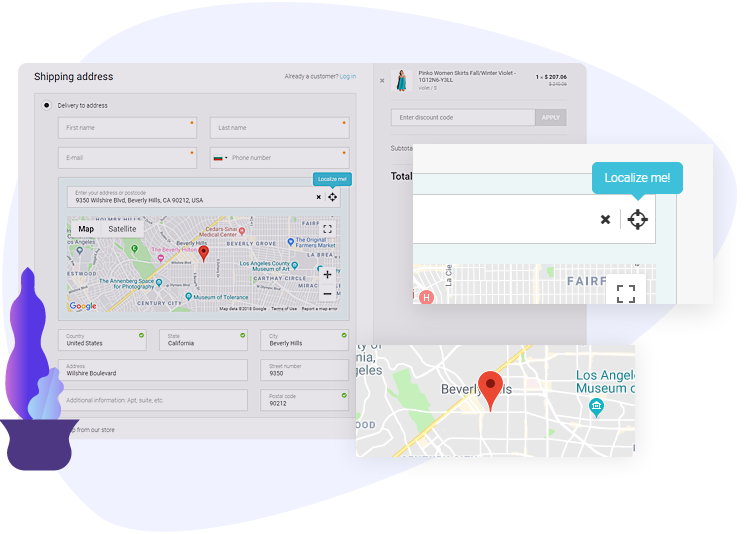 Our Checkout helps your customers skip steps by one-click localization - CloudCart automatically fills in their address fields using Google Maps Geolocation and speeds up their typing with Google Autocomplete text suggestions. 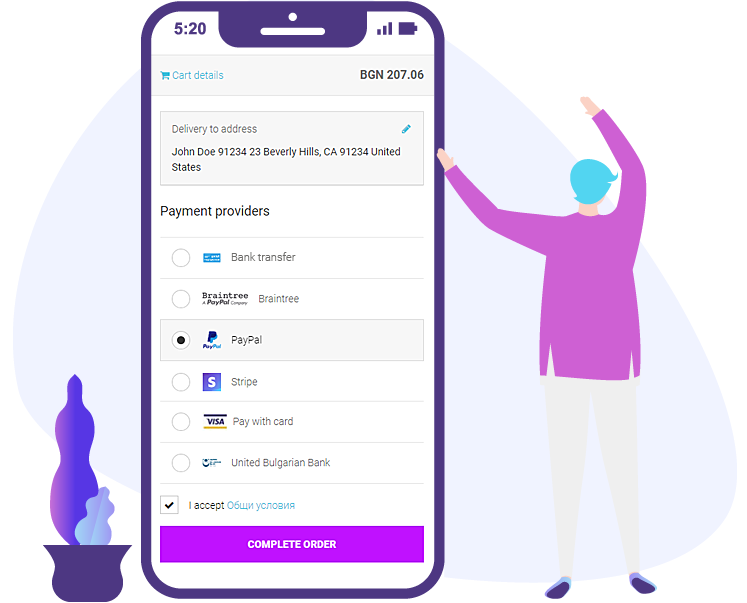 Our Checkout saves time & helps your customers finalize their order faster & easier by offering pre-defined delivery & payment methods that remove the need of additional clicks. 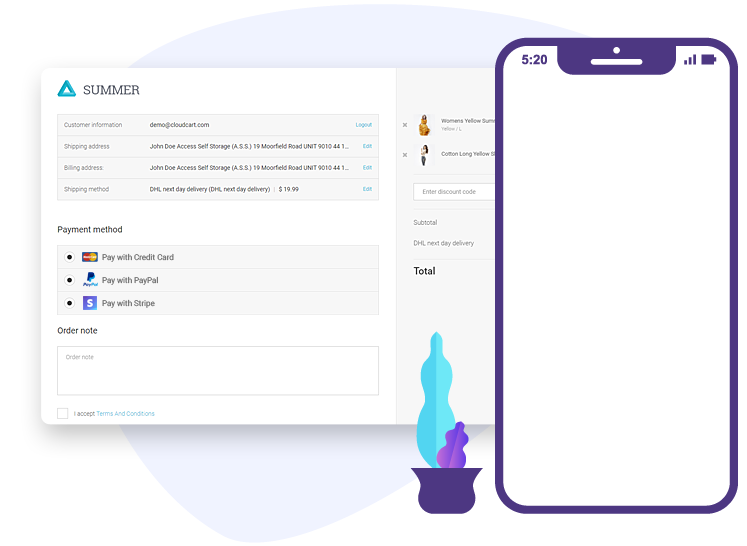 Our Checkout has 100% mobile & conversion optimized design without Headers & Footers or long scrolling user experience that confuse customers and prevent them from completing their order.